One of the first things that I did when I purchased the property was to introduce myself to the surrounding neighbours. Having a yarn and a cup of tea with locals is a great way to find out lots of useful information whilst building up a relationship with people around you. Being near a large river and on a flood plain, Seymour has seen its fair share of floods, mainly from the Goulburn River. This seems to be less of a problem now than it was before Lake Eildon was enlarged in the 1930's, and again in the 1950's. Station Street Seymour from the railway line, 1916. Hubert Miller recalls "there was a case in the... ‘74 I think, in February ’74 (it was actually February '73) when there was a 10 inch deluge in the Whiteheads Creek catchment (which is a tributary of the Goulburn, runs in at Seymour), which had quite a devastating affect flooding in the town, and there was one life lost. And that was certainly a flood which had social impact, there were certain works done after that to try alleviate the situation like enlarging the waterway under the railway line, and had a lot of tiding up to do, but that’s just shows how quick a local flood can hit you, and it certainly came somewhat unexpected and in the late summer too." Looking at the map below, you can see that there is quite a large catchment area to the north and south of Whiteheads Creek locality - this area feeds the Whiteheads Creek. The house site is the closest to the railway bridge at Whitehead Creek and was subdivided so that council could perform drainage works on the north western side of the block (facing Tarcombe Road). This site was later sold by council and was built on in 2000. This explains why the house is known as '74 Tarcombe Road' even though it is not on Tarcombe Road - very confusing if you are trying to find the place. The creek itself runs about 50m south of the house site. Whiteheads Creek Landcare, founded in 1986, has been addressing the salinity problems in the catchment as well as erosion control. Tree planting, understory restoration and wildlife corridors are being established which will help reduce runoff in times of heavy rains. But rains have become less frequent, but with greater intensity in recent years which would increase the chance of flash flooding events. This is no doubt part of the effects of climate change. 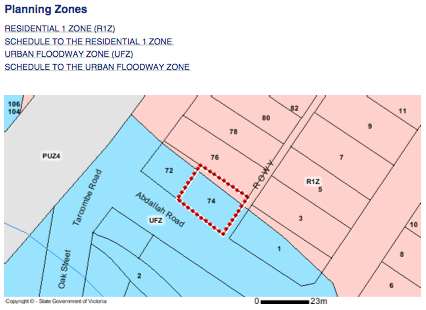 The house site is about 584m2, with most of the site within and 'Urban Flood Zone'. 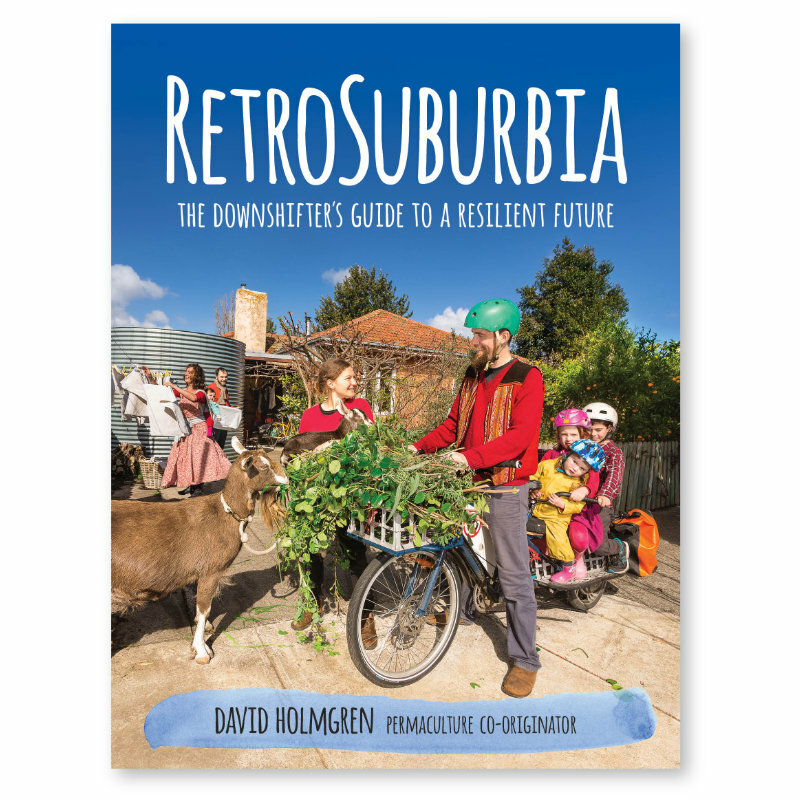 When contact was made with council to find out if it would be possible to develop the house I was directed to the Goulburn Broken Catchment Management Authority to find out their recommendation. The best estimate of the authority was that the property "is subject to significant depth of flooding as well as high flow velocities" for a 1 in 100-year event, it is in a "high hazard portion of the floodplain, where placement of the building is to be avoided", however the development of a dwelling in the property is unlikely to make a significant difference to the flooding situation. They recommended that any dwelling be constructed at least 300mm above ground level, which is 300mm above the previous flood level. The site itself is relatively flat, and being on a flood plain the soil is very fertile. The native River Red Gum was planted on the North Western side of the property about 60 years ago, and is around 20-25 metres tall. They are also known as 'Widow Makers' because of their tendancy to drop branches without warning. It is common knowledge in Australia that you never camp under a Red Gum, no matter how tempting it may be. The tree should never have been planted on a suburban house block. I have been told that a couple of branches have come down each year, but there has not yet been any damage to property. The tree leans over the neighbours house to the north west and the other neighbours garage to the north. Leaves and twigs fill the gutters and the threat of branches dropping on the buildings explain why both neighbours were very keen for the tree to be prunned or removed. The tree was marked with a big red 'X' - by one of my neighbours. As an incentive, the neighbours have offered to contribute for the costs of an arborist to do the job. I was impressed by their generous offer, as it is I that would be liable for any such work, or damage that the tree could cause. When I enquired to find out if I needed a permit to prune or remove the tree, the councils Environmental Officer contacted me to suggest that I retain the tree as mammals often breed in the hollows of such trees. These hollows only occur in very old trees - and none exist in this tree as yet. It turns out that I don't need a permit to do such work on a residential house site. that top picture...seems a little bit risky, but with a mind for watching the weather and living with the weather you will be alright and so close to the river... does that make you a river guardian? ?